Portland, OR. Nearly 20,000 charitable nonprofits across Oregon positively impact our communities every day, according to the Nonprofit Association of Oregon. Oregon ranks in the top half nationally in both volunteerism and average charitable contributions as a percentage of discretionary income at 4.6%. The power that individuals draw from giving to charity comes from a selfless act: it is often a deeply personal decision of the heart. That care of community, coupled with a hearty nonprofit sector in Oregon addressing a vast array of needs and missions, compels Oregonians to give and they give significantly. According to the 2015 Giving in Oregon report by the Oregon Community Foundation, more than $1.76 billion was donated by private individuals. The Foundation Center reported that for 2014, Oregon’s 878 foundations gave more than $371 million to nonprofit causes and projects. Although charitable giving occurs throughout the year, the fourth quarter of each year is a critical fundraising time for nonprofits. As a result of the changes to the Tax Cuts and Jobs Act, Nonprofit Association of Oregon wants to ensure Oregon nonprofits are at the forefront of people’s minds during this giving season. The Nonprofit Association of Oregon is the statewide nonprofit membership organization representing and supporting charitable nonprofits of all sizes, geographic locations and missions across Oregon. NAO’s mission is to serve public benefit nonprofits by strengthening the collective voice, leadership, and capacity of nonprofits to enrich the lives of all Oregonians. NAO’s vision is that Oregon’s nonprofits are visible and valued as essential contributors to society. We are deeply invested in our core values: Collaboration, Equity and Inclusion, Excellence, Impact, Learning, Service and Stewardship. NAO ensures a future in which Oregon nonprofits are visible and valued as essential contributors to our society. We strive to connect, improve and advance all nonprofits to help build a thriving and vital Oregon. NAO serves the needs of the nonprofit sector through our work in advocacy, convening, disseminating Principles and Practices for Nonprofit Excellence, capacity building and thought leadership. Affiliate membership for businesses that offer services and products to nonprofit organizations; as well as other 501(c) nonprofits, government agencies, individuals, etc. Membership with NAO offers charitable nonprofits access to resources; attend high quality and relevant professional and volunteer development events at significantly reduced rates; network and learn with other nonprofits; connect with businesses who support nonprofits through cost-savings services and products; and amplify your voice with decision makers. Affiliate membership with NAO offers businesses, other entities and individuals who support the work of nonprofits to connect with and be part of NAO’s network. This may include businesses who provide products and services to the nonprofit sector, organizations who support nonprofits as part of their community engagement work, or individuals who volunteer in service to the nonprofit sector. Business Affiliate Members at the Verified Level have the opportunity to potentially partner with NAO to offer cost-savings products and services to nonprofits and be part of NAO’s Referral Service. Learning & Professional Development: NAO offers a wide variety of professional and volunteer development learning opportunities for nonprofit leaders and their staff. NAO regularly offers sessions in the Portland area, Central Oregon, Southern Oregon and in a specific menu of rural locations across the state. Additional workshops, webinars, and online resources ensure that nonprofits all over Oregon have access to these valuable resources and opportunities. Learn more. Referral Service: When nonprofits seek consulting services to meet challenges, support their growth, build effectiveness, and achieve excellence – whether it is a consultant to facilitate a board retreat on diversity, equity and inclusion, an interim executive placement, executive search, or other projects – NAO can match a nonprofit to a vetted and proven expert consultant or service provider. Consultants and service providers must be NAO Business Verified Affiliate Members. Learn more. Cost Savings on Services and Products: NAO forges partnerships with NAO Business Verified Affiliate Members who want to support nonprofits by offering discounts on services/products. Nonprofits can save money by taking advantage of these cost-savings opportunities. Learn more. Convenings: NAO provides opportunities for nonprofits and those that support the nonprofit sector to convene, network, discuss issues, offer solutions, and share best practices. NAO frequently partners with local, statewide and national networks, funders and research partners to convene these gatherings to create meaningful dialogue and discussion. Learn more. Thought Leadership: NAO provides thought leadership at the overall nonprofit sector level about and for the nonprofit sector. We lead the effort to conduct, collate and share key research information about and for the nonprofit sector. We also ensure that Oregon’s nonprofits and the general public have relevant and timely information about changing ideas, opportunities and issues that affect nonprofits around the state. Advocacy: NAO amplifies the nonprofit sector’s voice through public policy and advocacy work on behalf of Oregon’s nonprofit sector. NAO directly advocates on behalf of all nonprofits, as well as catalyzes important conversations with policy makers and among nonprofits. We work to raise the awareness of nonprofits’ work, issues and need for policy change. We educate and inform policy makers and others at the local, state and federal levels to ensure that nonprofits can continue to do the direct service work they do for the benefit of our communities across Oregon. Learn more. Through these programs and services, NAO helps to connect, improve and advance the nonprofit sector across Oregon. Join us and be part of an effective and connected network that is doing great things to improve and advance Oregon’s nonprofit sector! Windsor, England. If you’re like us, the wedding of the youngest daughter of Prince Andrew and Sarah, Duchess of York, caught us a bit by surprise. It happened without the buildup of the nuptials of Catherine, Duchess of Cambridge and Prince William or Prince Harry and Meghan, Duchess of Sussex. The royal family’s press office has released portraits from the princess’s wedding to Jack Brooksbank – presented here with other pictorial highlights from the wedding day in Windsor. The newly married couple is pictured in the White Drawing Room, Windsor Castle with their bridal party including The Queen and The Duke of Edinburgh. Middle row: Prince George; Princess Charlotte; Her Majesty The Queen; The Duke of Edinburgh; Miss Maud Windsor; Master Louis De Givenchy. Front row: Miss Theodora Williams; Miss Mia Tindall; Miss Isla Phillips; Miss Savannah Phillips. In this second photograph the couple are pictured with their Bridesmaids and Page Boys, again in the White Drawing Room at Windsor Castle. Back row: Prince George; Princess Charlotte; Miss Theodora Williams; Miss Isla Phillips; Master Louis De Givenchy. In this third picture the couple are pictured in the Scottish State Coach, upon its return to Windsor Castle following the Carriage Procession. Before the wedding, guest arrivals were captured by photographers. Princess Eugenie walks down the aisle with her father, the Duke of York. 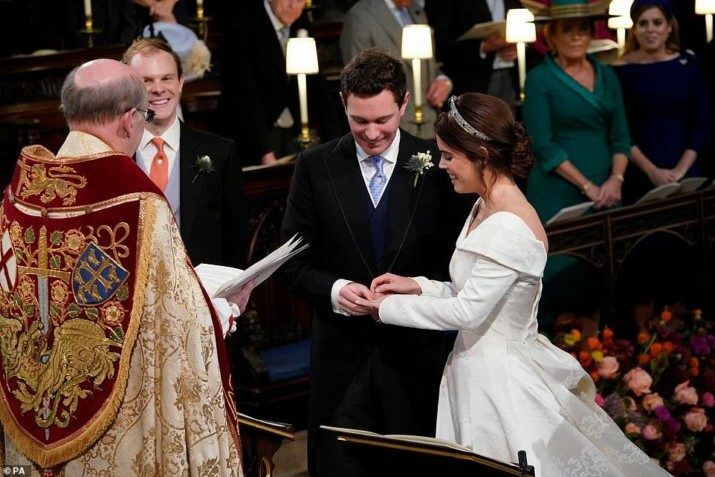 Princess Eugenie and Jack Brooksbank exchange rings. Princess Eugenie and Jack Brooksbank set off on a carriage ride through Windsor. Princess Eugenie and Jack Brooksbank are pictured at Royal Lodge, Windsor ahead of a private dinner. It was the second royal wedding of the year. The groom, Jack Brooksbank, 32, started dating Eugenie, 27, seven years ago. They met while skiing in the Swiss resort town where Eugenie’s parents co-own a home. Portland, OR. The McCulloch Foundation is gearing up for “2018 Halloween Haunted Historical House, a Benefit for Affordable and Homeless Housing and Historic Preservation.” Visitors can be spooked and thrilled at the creepy Queen Anne Victorian mansion on NE 15th Ave in Irvington. The McColluch Foundation (a Non Profit Organization) is raising money to build affordable housing for those in need, while also protecting further demolition in the area. The Haunted House will take place October 24th – 26th and tickets are $15 – $25. Portland, OR. Move over June brides, October 20th is the number one day of 2018 to get married! The once-popular summer wedding trend has officially been dethroned, according to the wedding registry site, Zola. The most popular wedding season of 2018 is fall. The wedding site gathered evidence that, for the first time ever, 40 percent of all weddings will take place during the months of September and October. Additionally, only one of the top 10 wedding dates falls before September. A fall wedding makes for cooler temperatures and less bugs if you’re outside. With a plethora of pumpkins, there are some festive and unique wedding styles to embrace. October was the month U.S. Army veteran Justin Lansford married his longtime girlfriend, Carol Balmes. Lansford’s service dog, a golden retriever named Gabe, served as best man. Seasonal fall flower can have bold combinations of the jewel-toned colors like deep purple, rust, scarlet, and gold. We’re thrilled to launch this new platform, societypageweddings.com, where you can share one of the most important stories of your life – the story of your love. Society Page Weddings is about celebrations. Do you have an engagement to announce? Would you like to share the exciting details of your wedding? Wouldn’t it be nice to honor a special couple with a story about their anniversary? You’ve come to the right place! Megan Landmark Wed to Swedish Ice Hockey Defenseman Anton Cederholm at Oregon Golf Club. Jenna Bennett Weds and Brandon Jackson in July Oceanside Ceremony. Society Page Weddings is a website which picks up the bridal bouquet where local newspapers have unfortunately dropped it. There’s just no place where you can read about weddings in most local papers anymore, and that’s no fun. At this website, you can read about the joyful celebrations of your friends and neighbors. We need more good news in the world and more reasons to celebrate! Society Page Weddings is part of the Society Page family of media platforms first designed to provide a platform for nonprofit news. That testimonial from “I Have A Dream” Foundation – Oregon validates our passion for honoring the work of local charities. PortlandSocietyPage.com is a free public news source for nonprofits. Trusted, accurate and positive, we love our local charities and their vibrant events! As the Editor and Publisher of PortlandSocietyPage.com, it’s my privilege to collaborate with Development Officers in the nonprofit community to honor patrons who make a difference. I’ve been a professional journalist and writer since 1987, (and long-time reporter for KOIN-TV.) I’m also a member of the Society of Professional Journalists. As an member of the National Charity League, I’ve seen first-hand the transforming power of authentic community involvement. Now, we’re thrilled to announce Society Page Weddings is here to stay. Contact us to find out how you can submit!